There was a bit of an internet kerfuffle during the week over pre-packaged cauliflower steaks sold by M&S. I'm not going to get into the politics of pre-packaged food here. Mostly because Amy Jones does a far better job at The Pool, with her article Pre-prepared vegetables are a vital product, not a frivolous waste, which is absolutely worth a read. Anyway. It was interesting timing, because a few days earlier I'd tried making roasted cauliflower for the first time (yes, I know). 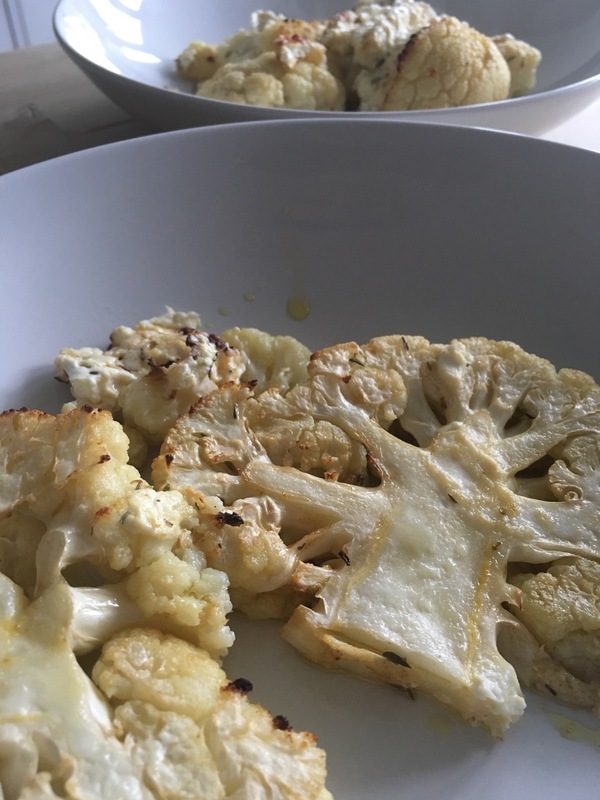 Having enjoyed that enough to buy a second cauliflower to roast, and read the inevitable Guardian article about making your own cauliflower steaks I thought I'd give cauliflower steaks a try. I did a bit of a google and found a ton of things, and then remembered the recipe for baked feta (from Thomasina Miers book: Wahaca - Mexican Food at Home) we tried on Hogmanay (which went down a storm) and decided to see what would happen if I used that as a base. The result worked way better than I hoped. It was super tasty. The combination of the slightly sweet cauliflower, the slightly tart dressing and the slightly salty feta worked really well. So well I did it again a couple of days later with the rest of the cauliflower and feta. Turned the oven on to 180 degrees to heat up. Then I stirred it up and put it to one side while I prepared the cauliflower and feta. Cauliflower prep was taking the leaves off, and cutting the stalk down until the cauliflower would sit on the table like a brain. Then I cut it into five slices. Feta prep was cutting a block of feta in half and then cutting that half into cubes. 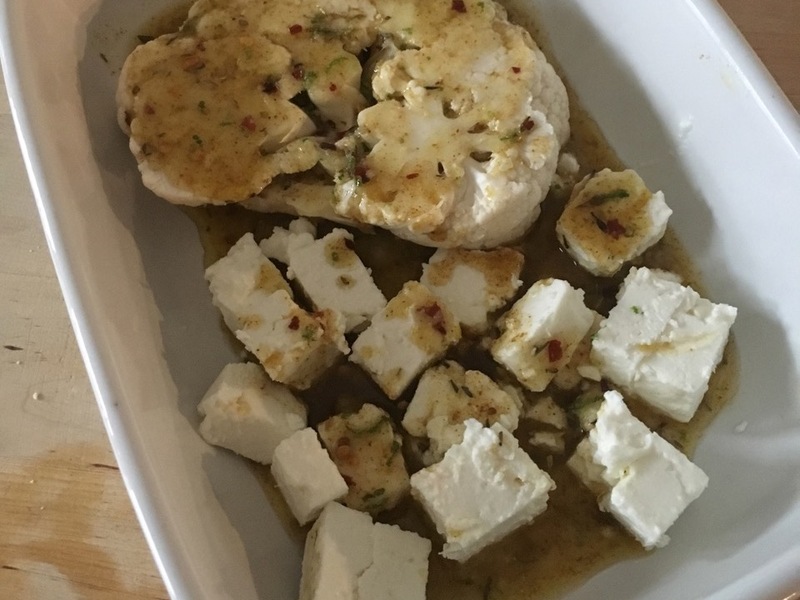 I took a ceramic rectangular baking dish out of the cupboard and added the cauliflower and feta to it, making sure that they were spread out and not overlapping. By this time the oven was hot enough and I put it in for ten minutes. When the timer went off I took it out and flipped over the cauliflower steak and then put it back in for another ten minutes. When the timer went off after the second ten minutes I tested the cauli with a fork to see if it was done, and it was a little firm still, so I put it back in for five minutes. The second time I did it I put the cauli steaks in the dish and microwaved them for 4 minutes before adding the feta and dressing. I then baked the whole thing for 20 minutes, turning half way through. The cauliflower was possibly borderline too soft, so if I was doing it again, I'd probably cut that down to 15 or 16 minutes. After that, all that's left is to eat it. So we did. I've had a few goes at doing colour swatches for my watercolours over the last couple of years. I think I got the idea from Jen Dixon. I was never really 100% happy with them, and they've never been particularly easy to use or refer back to, so a few months ago I started trying something a little different, to see if that would make things better. Then, life got in the way, as it does, and it never got any further than a bit more experimenting. 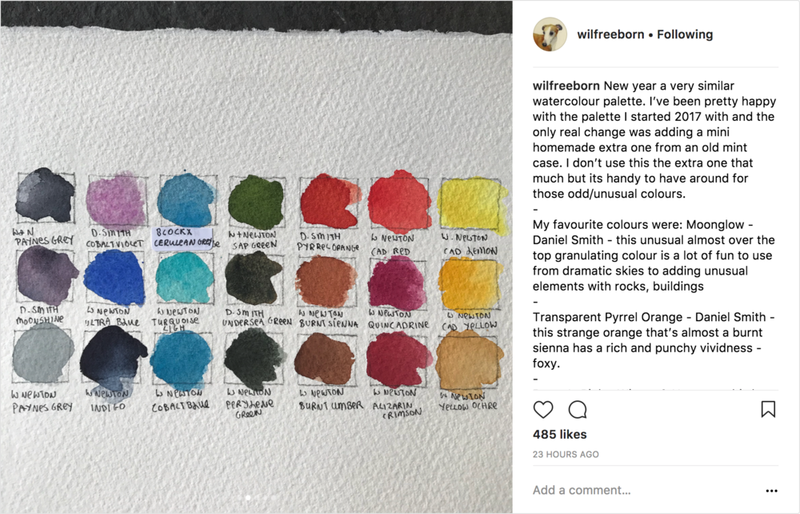 The other day, I spotted @wilfreeborn (who I found in an article in Artists & Illustrators magazine and who has been a massive source of inspiration since I started following him on instagram) swatching his 2018 palette on his instagram stories, and then found his post about it, and it reminded me of that thing I started to do some months ago and then never took any further. I got my pencils and ruler out and made a bit of a chart, then went over it with my pigment fineliners, so the ink wouldn't wash away or spread when I put the paints and water over the top. I drew a bar a quarter of the way across the box so I could tell where each paint was on the opaque to transparent scale. Once I'd done that, I realised I wanted one sheet for each group of colours, and, since we had a shiny new multifunction printer, wondered if I could photocopy each sheet onto watercolour paper, so I wouldn't need to draw each one out by hand. Miraculously, it worked, and it turns out my printer comes with archival ink by default. Bonus! My page of yellow colour swatches, surrounded by some of my watercolour palettes. This morning, I found those photocopied sheets and decided to dig out all my paints and get started. I wrote the colour name at the top (in fancy calligraphy, because I felt like it) and set about swatching all the yellows I could find. Then, when I was taking a picture of it to post online, I thought that if I found this useful, then others might, and so I wandered over to the computer and made a quick wee PDF. Colour swatches PDF printed out on basic printer paper, double sided, and with one swatch on each side filled in. Now, as I've mentioned above, I'm lucky in that I have a printer that can be fed heavier paper (up to and including 300gsm watercolour paper) and uses archival ink by default (so it doesn't go funny when I put water on it). You might not have the same, but if you're having trouble with the ink going funny when you print it, you could use the template as a guide and trace or copy from it using a pigment ink pen. So without further ado, have at it! If you find this useful, let me know! I can be found as @pixeldiva on instagram and twitter. I don't do well with cereal in the morning. I hate the stuff. Not a huge fan of milk. Toast doesn't do it for me and I end up eating way too much bread. So I struggle to find interesting, healthy, tasty things to eat in the mornings. I've read a few things on Pinterest about crustless mini quiches and when pottering around this morning decided to give them a go. I pre-heated the oven to about 180. Dug out the muffin tray, sprayed a bit of that 1 cal oil spray into each divot and set about seeing what we had in the fridge. I found some leftover ham, a couple of courgettes and some baby plum tomatoes, as well as some Double Gloucester cheese and 4 eggs. I sliced the courgette quite thinly and then cut each slice into quarters and chucked 4 quarters into each divot. I then sliced the tomato into 4 slices and chucked them in too. Then I cut some small cubes of ham and added them too, getting slightly worried that I was over-filling each divot and leaving no room for egg. I cracked the eggs into one of my trusty Pyrex jugs, set about them with a fork and added some freshly ground black pepper before pouring the mixture into the each divot. Amazingly, 4 eggs was the perfect amount of egg for filling, and each divot was filled to just below the top. I grated 30g of Double Gloucester and added a pinch to the top of each mini quiche-to-be, like so. I bunged them in the oven and set the timer for 10 minutes, hoping for the best, staying nearby so I could keep an eye on them in case they went up in flames or did the tango or something. 10 minutes later they came out of the oven looking fab and smelling great, and with a tiny bit of persuasion from a knife, were transferred to my plate. At which point Jnr came into the kitchen, looked at my plate and announced that he wanted a pizza. So I gave him a mini quiche and didn't bother correcting him, figuring it's no bad thing if he thinks these are pizzas. His eating of it went surprisingly well until he encountered unexpected tomato in the eating area, at which point the game was a bogey and his dad finished the rest of the quiche. Many way. Surprisingly easy, tasty and fun. No idea why I haven't tried this before. And in terms of what you chuck in the divots - the possibilities are endless. If you give these or something similar a go, I'd love to see/hear what you did, either in the comments or in Twitter. And yes, I do like the word divot, why do you ask? I did the C25K program and you'll never guess what happened next! Blogging in 2015 is a funny beast. When I began, in March 2000, there were an awful lot more personal blogs than any other kind. Nowadays, it's all about being a Lifestyle blog, or a Fashion blog or a M(o)ummy Blog or a whatever the hell blog. And I get it. Blogs are big business now, and how can you make money unless you're specific about your audience and what you offer them, but I miss the old personal blogs. I miss writing a personal blog. I've tried so many times over the last few years to start blogging again, even creating separate blogs, but the truth is that I don't want to be limited by writing about just the one thing. I don't want a knitting blog, or a mummy blog, or a professional design blog, or a running blog, or a stationery blog, or a craft blog, or a nail blog. I just want a me blog. So that's what I'm going to do. I'm just going to write. About whatever moves me, and not worry about audience or social media strategies or following any of what seem like the million rules that have sprung up about how to blog. Why now? Well, I was a bit inspired by what Norm and Neil wrote this week about side projects, and accountability. "My favourite time of the day is first thing in the morning. I like to get up at [the crack of sparrowfart, or earlier] before everyone else gets up. It's so peaceful, and I can have that time to myself before the demands of the day kick in". and I'd be thinking to myself how crazy she was, and that she could be sleeping! Oh, how little I knew. Since becoming a mother, I have a window of approximately 30 seconds in the morning, where, if all goes well, I can go back to sleep. Anything beyond that and it's too late. I'm up for the day. I didn't used to be like this. I sometimes really wish I wasn't like this. There is something kind of magical about the peace and quiet in those early hours. The gift they give of being able to come in to yourself slowly. With a cup of tea and a book, or some knitting, or the breakfast you want, when you want it, without a tiny human hanging off your legs. To sit on the toilet without someone actually sitting on you. The time to be you. Not mum, not wife, not host. No demands, no conversation, no noise. I knew about hand cream before I became a mum. And occasionally I bought some, thinking that I should really use it, but I never really did. Then I became a mum and the hand-washing really started. Don't get me wrong, it's not like I was a dirty skank before. I washed my hands. I just didn't have the need to wash my hands quite so bloody much before. Never mind washing that man right out of your hair - babies will make you wash that skin right offa your hands. Hand cream. Bloody brilliant. Current fave: Neal's Yard Melissa Hand Cream. Sure, they're nice and all, but you can get the same effect just having a bath and doing stuff at home, right? That was before I knew that actually having the time to run a bath, get into it, have a soak, a read, a relax, uninterrupted for at least an hour, was likely to be rarer than hen's teeth. Sometimes, I fantasise about running away to a Premier Inn for a night. Just so I can have a bloody bath and not have to sleep with one ear open, in case Junior needs me. As I enter week 3 of the virus that keeps on giving, I'm reminded again that no matter what else is going on, I can't just retire to my bed with a box of Kleenex Balsam and all of netflix for days, until I feel better. That's not to say that MrP doesn't help - he does, but sometimes, only mummy will do. So unless I'm out of the house, I'm very very rarely entirely off duty. I know this will get better as he gets older, but sometimes, when I'm feeling really really awful, I just want to hibernate and not have to deal with anyone else's needs.